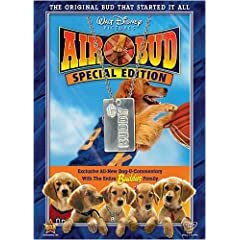 The original Bud that started it all is back in a new Special Edition featuring an exclusive Dog-U-Commentary with the entire BUDDIES family. Buddy, the sensational real-life hoop hound with 22,000 career baskets under his collar, stars in this hilarious and touching Disney comedy that critics and families cheered as irresistible family entertainment! When Josh Framm, a 12-year-old boy, finds himself in a new city with no friends, he’s too shy to try out for the basketball team. However, while practicing, he meets Buddy, a runaway golden retriever, who surprises him with his ability to score baskets. Josh and Buddy eventually make the school team, and the dog’s extraordinary talents spark a media frenzy — one that attracts Buddy’s greedy former owner who wants to cash in on the dog’s new found fame. Josh and Buddy have to stay one step ahead of the brute — and rally their school team to the state finals at the same time! Dog-U-Mentary with the Buddies: Exclusive commentary from the Buddies on Air Bud—the story that started it all!